Sharing content such as presentations, images or videos on a visual communication device usually requires having the file on a PC to project it. To share from a personal device, some solutions would require installing a software client on the device to be able to share wirelessly while others don’t even offer this option. In professional meetings, content is crucial and sharing it with all the participants should be an easy task. Meeting rooms or visual communication solutions should be designed to receive content from various devices over various connection types to offer a flexible content sharing experience during meetings and video calls. With Silex room solutions and Silex PTE devices, sharing content is simple and clientless. Silex solutions allow users and visitors to use their personal device to start sharing on any type of connection and especially wirelessly using standard clientless wireless presentation protocols. With the CYOD (Connect Your Own Device) feature, we allow users to choose their preferred way to share and display content from the device of their choice, without worrying about the technology. Be it from a Smartphone, a tablet, a laptop, a USB key, an external accessory or from the cloud, any participant in the meeting can display the content on the local screens and with video participants. CYOD – How does it work? Using Airplay technology, the user can mirror the content from a personal iOS device to the Silex system wirelessly and without installing any software client on the device. The content would become automatically visible to all participants locally and to remote video participants. 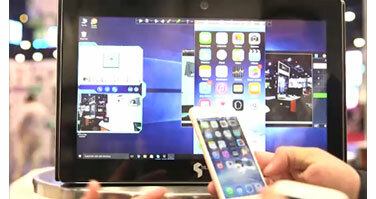 Using the Miracast standard wireless screen mirroring protocol, the user can share content from any Android device by mirroring the content to the Silex system wirelessly and without installing any software client on the device. The content would become automatically visible to all participants locally and to remote video participants. A PC can be connected to the Silex system in two different ways, depending on the Windows version installed. Via HDMI by connecting the PC to the Silex system using an HDMI cable. This option works for any PC. Wirelessly and without installing any software client on the PC, by using the ‘Connect to a wireless display’ option from laptops running Windows 10 or Windows 10 Pro to connect to the Silex system and share the content. Just connect the USB stick to one of the USB ports available on the Silex PTE systems and in the Silex Rooms to open its content and display it on all screens locally and with video participants. Any visualizing device or accessory that connects through HDMI can be connected to the Silex systems and the content will automatically be displayed on all the screens and shared with remote video participants. Any visualizing device or accessory that connects through Bluetooth can be connected to the Silex systems and the content will be displayed on all the screens and shared with remote video participants. The Silex systems being connected to the corporate network, it is easy to access your data on the cloud or from a server on your network and display it on the system’s screens and share it with remote video participants.